Canadian Wildlife Federation: My cat brought home a mouse but it's still alive. Can I save it? My cat brought home a mouse but it's still alive. Can I save it? A. This isn’t an easy question to answer. 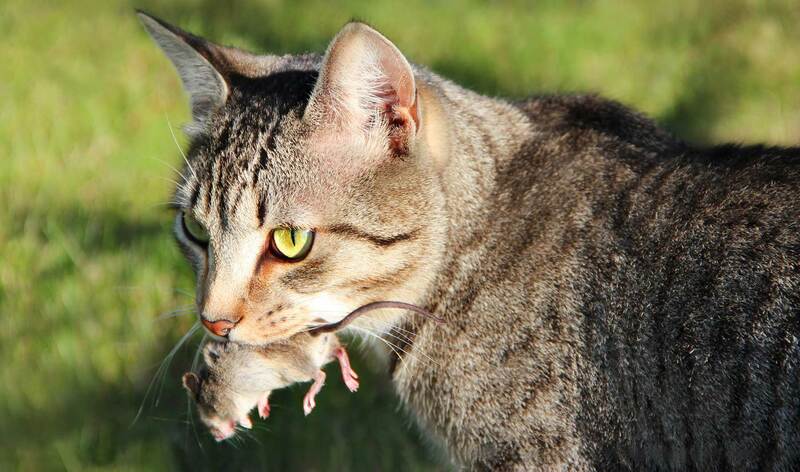 Cats are notorious for proudly bringing home all kinds of critters – birds, rabbits, chipmunks, frogs and mice – really whatever they are able to catch. Some people say rescue the animal, others say let nature take its course, while others say take it to a wildlife rehabilitation centre. Perhaps a better way to answer this question is to look at the impacts outdoor cats have on wildlife. Because this probably won’t be the last mouse your outdoor cat brings home. A 2013 study called “Estimated Number of Birds Killed by House Cats (Felis catus) in Canada” reports that an estimated 100 to 350 million birds are killed by cats every year in Canada. It also states that this is probably the largest cause of human-related bird deaths in this country. And of course we can’t forget about the impacts on other wildlife. If we consider outdoor cats – many will hunt, regardless of whether they are hungry or not. They are excellent hunters, quite stealthy actually – so much so that they can even silently walk with bells on their collars! They are not a native species and therefore wildlife have not developed any defenses against them. Having an indoor cat will not only help wildlife but will provide many benefits to your cat too! When I was a kid, we had a cat that was both indoors and outdoors (before I was aware of all the dangers of letting him outside, of course!) and he would often come home with obvious signs of not-so friendly encounters with what I’m assuming were with other cats. Keeping a cat inside protects them from all kinds of hazards, including other animals, vehicles, people and diseases – leading to a longer and healthier life. For an indoor cat to be happy he or she may require some extra play time with you; you’ll want to make sure they get rid of that excess energy in a non-destructive way! You can even consider using a cat enclosure; this will allow your cat to be outside in a safe way. I’m told that with a little bit of work, cats can even be leash trained. So to reduce the number of animals your cat brings home to you, consider transitioning him or her to a life indoors or to one that involves controlled outside time!